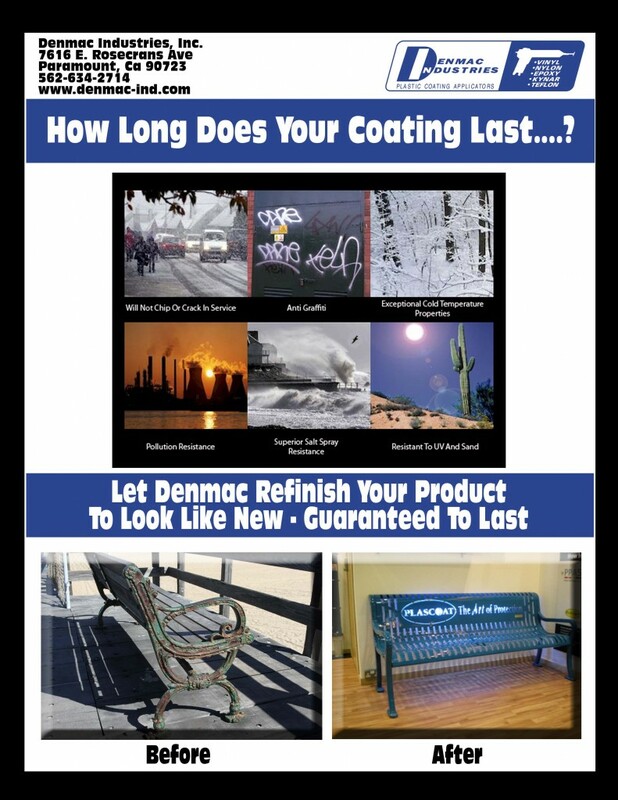 Denmac applies DuPont Teflon© industrial coatings in both powder and liquid form. The versatility of the Teflon© coatings allow almost unlimited application to a wide variety of part sizes and configurations, always adding value far beyond the inherent nonstick qualities. Teflon© industrial coatings are applied like paint and then baked to a tough, inert finish. DuPont has developed an extensive variety of of Teflon® industrial coatings to ensure a finish with the ideal combination of properties to meet most design needs. The Denmac staff will insure the best Teflon© industrial coating is applied, whether it is Teflon-S©, PFA©, PTFE©, ETFE©, PTFE© or other Teflon coatings. 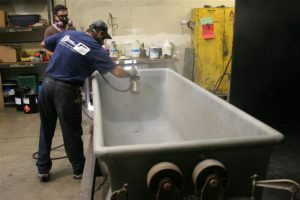 Teflon© industrial coatings combine heat resistance with almost total chemical inertness, excellent dielectric stability, and a low coefficient of friction. The Teflon©industrial coatings offer a balance of properties not available with any other material. 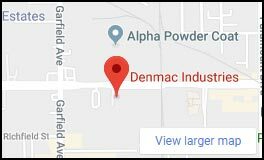 Denmac works with DuPont, the originator of Teflon© industrial coatings, who provides worldwide resources to help you solve your coating problems. The low coefficient of friction, heat resistance, cryogenic stability, chemical resistance and unique electrical properties make Teflon© industrial coatings an excellent choice for many coating applications. Contact Denmac now and our engineering staff will work with you to select the best Teflon© industrial coating for your application. Polyester powder coatings exhibit excellent flexibility and durability with very good outdoor (UV) resistance. 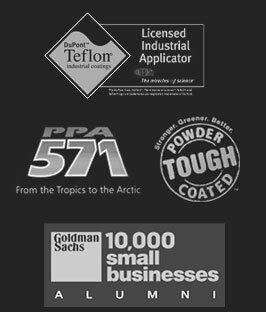 They represent approximately 50% of all powders used in North America today. Polyester provides smooth, thin coatings in a full range of glosses, from very high gloss (90%) to very low gloss (5%). 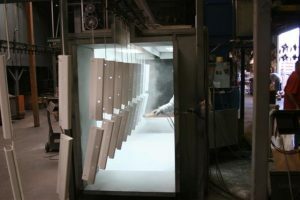 Polyester powder coating is designed to produce thin film coatings in the range of 1 to 4 mils and are applied by the electrostatic cold powder spray method. Epoxy powder coating is a thermosetting material, applied by electrostatic spray, fluidized bed, and hot flocking. It offers the best chemical and corrosion resistance. It is used in the coating of gas and oil pipe, which are buried and cathodically protected against underground galvanic corrosion. Epoxy provides excellent protection in these environments but have other limitations, primarily its poor resistance to ultraviolet (UV) radiation. When exposed to sunlight or other UV radiation, it “chalks”. This is a milky or chalky surface condition, which in many cases can be removed by washing or polishing. It reforms rapidly, however, and presents an aesthetic problem. Epoxy powders are also designed to serve as decorative as well as functional coatings with a wide variety of colors. Epoxy powder applied cold by electrostatic spray produce thin films of 1 to 4 mils. Thick films of 10 to 20 mils can be achieved by heating the part to be coated and fluid bed coat (dip), hot flock spray, or electrostatic spray. Other typical applications include automotive accessories and underbody, metal cabinetry, power tools, sports equipment, electrical apparatus and framework, light fixtures, indoor furniture, metal shelving, and wire goods. Make your coatings pop with our glow in the dark process.